STECA is a German company, specializing in battery charging systems and solar panels manufacturing, controllers and devices. Since its founding in 1976, the company is growing steadily and today is a well recognized brand with stable positions on the global market. Steca pays strict attention to the environmental protection and its products contribute to the reducing of energy consumption and pollution.The company is certified by EN ISO 13485: 2003, ISO 9001: 2008, ISO 14001: 2004, TS 16949 and has all the quality certifications such as CE, VDA 6.3, TUV etc., ensuring premium quality, safety and reliability to its customers. The optimized coordination between production and testing of products that the company offers are the cause of saving production time and minimum defects in the finished products. STECA is a guarantee of German quality and precision. VIKIWAT Ltd. is a wholesaler and retailer of a variety of STECA product catalog. In our offline and online stores you can easily find in stock quantities a wide range of solar charge regulator SOLSUM at affordable prices and with quick delivery. 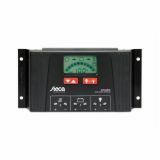 Controller for solar system STECA, Solarix 4040, 40A, 12V/ 24V STECA solar controller Solarix 4040, 40A, 12-24VDC features high end state of charge control (SOC), USB charging port, PWM controller type, graphic LCD display, professional battery care, automatic battery voltage detection and full load protection. Made in Germany. 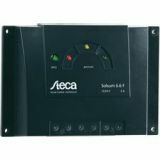 Controller for solar system STECA, Solsum 4040, 40A, 12V/ 24V, IP30 STECA solar controller - model Solsum 4040, 40A, 12-24V is easy to use charge controller with multifunctional LCD display, automatic battery voltage detection, full load protection and offers low self consumption. Made in Germany. Solar Charge Regulator SOLSUM 6.6F-6А 12/24V Solar panel and charge controller with power up to 6A suitable for application in solar power systems up to 180 W.
Solar Charge Regulator SOLSUM 8.8F-8А 12/24V Solar panel and charge controller with power up to 8A suitable for application in solar power systems up to 190 W.
Solar Charge Regulator SOLSUM 10.10F-10А 12/24V Solar panel controller with rated charging current 10A. Solar Charge Regulator PRS 1515, 12V/24V, 15A Solar Charge Regulator PRS 1515, 12V/24V, 15A. Solar Charge Regulator PRS 3030, 12V/24V, 30A Solar Charge Regulator PRS 3030, 12VDC / 24VDC, 30A. Solar Panel Regulator STECA, PR 1010, 10A, 12/24V, with display Solar Panel Regulator 1010 PR, 10A, 12/24V, with display. Solar Charge Regulator PR 1515, 12V/24V, 15A Solar Charge Regulator PR 1515, 12 V /24 V , 15 A. Solar Charge Regulator PR 3030, 12VDC/24VDC, 30A Steca PR3030 series controllers are among the best solar system controllers. They are produced with the newest technologies along side with Steca-AtonIC state of charge determination and this allows them to provide long battery life and control of the module. Solar chгarge regulator, Tarom 4545, 45A, 12V / 24V The solar controller monitors the state of charge of the battery, manages the charging process, and also turns on and off the consumer. Thus, the battery is used in an optimal and considerably increases its life. The latest technology combined with the advanced algorithm for the state of charge provide long battery life and control of photovoltaic panels at home solar systems. A large display informs the user by using the symbols for all modes. Charge level is plotted as a fuel gauge on the car. Data such as voltage, current and state of charge can also be displayed digitally as figures on the display. Furthermore, the controller has an energy meter which can be reset by the user and a dato logger and the data could be read through a RS232 port. Solar chгarge regulator, Tarom 4545-48, 45A, 12V / 24V/ 48V The solar controller monitors the state of charge of the battery, manages the charging process, and also turns on and off the consumer. Thus, the battery is used in an optimal and considerably increases its life. The latest technology combined with the advanced algorithm for the state of charge provide long battery life and control of photovoltaic panels at home solar systems. A large display informs the user by using the symbols for all modes. Charge level is plotted as a fuel gauge on the car. Data such as voltage, current and state of charge can also be displayed digitally as figures on the display. Furthermore, the controller has an energy meter which can be reset by the user and a dato logger and the data could be read through a RS232 port. Solar chгarge regulator, Tarom MPPT 6000-M, 60A, 12V / 24V/ 48V The Steca Tarom MPPT solar charge controller sets new standards in the area of Maximum Power Point trackers. 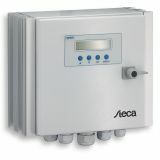 Outstanding efficiency along with unique safety features make it a universal top-grade charge controller. There are two inputs that can be connected in parallel or used separately. Each input has its own MPP tracker. So there are two charge controllers available in one device. Different module arrays can be flexibly combined in one charge controller. With an input voltage of up to 200 V, all kinds of solar modules can be used in various connection schemes. This charge controller combines high flexibility, maximum yields, professional battery care and an appealing design on the basis of advanced technology. A large display informs the user by using the symbols for all modes. Charge level is plotted as a fuel gauge on the car. Data such as voltage, current and state of charge can also be displayed digitally as figures on the display. Furthermore, the controller has an energy meter which can be reset by the user and a dato logger and the data could be read through a RS232 port.